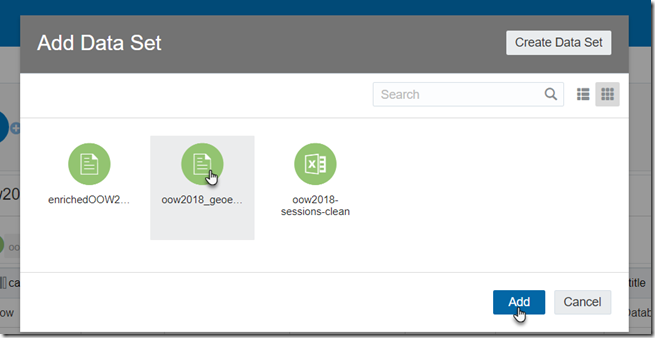 In this article, I will show how I have created a Data Flow in Oracle Analytics Cloud to enrich a data set with geocoding data from a different data set, in order to be able to create a map based visualization of data. 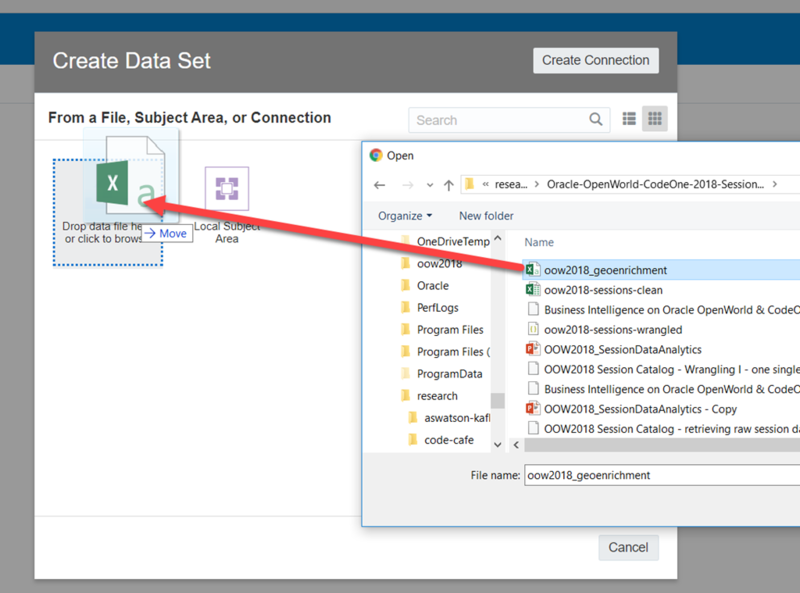 More specifically: in a previous article I introduced a data set with the Oracle OpenWorld and CodeOne 2018 session catalog. I demonstrated how I got going on Oracle Analytics Cloud with this data set, and how I created my first visualizations. The session catalog contains the room in which each session takes place – and the first part of the room indicates the venue. These venues can be plotted on a map. 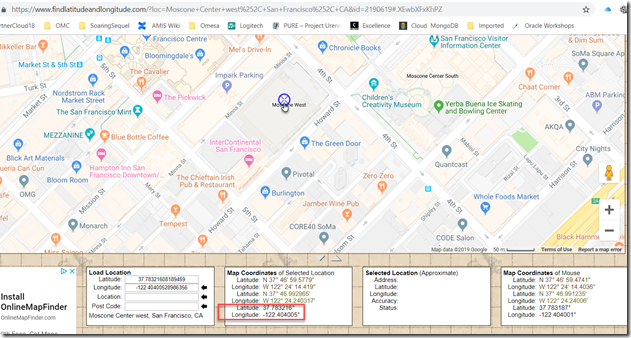 My objective in this article is to associate the geocoordinates of the venues with each session record and subsequently use that encoding for visualizing the sessions on their actual geographical location on the city map of downtown San Francisco. 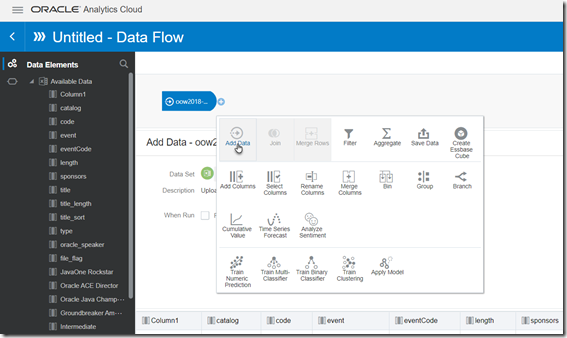 I will use a Data Flow in OAC to perform two actions. First I will create a new column called venue that is derived from the first ten characters of the room column. This will derive one of eight venue values for each session. 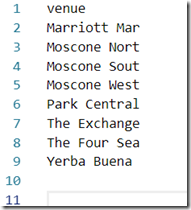 Then I will join the sessions data set with a data set that contains the geo locations for each venue. 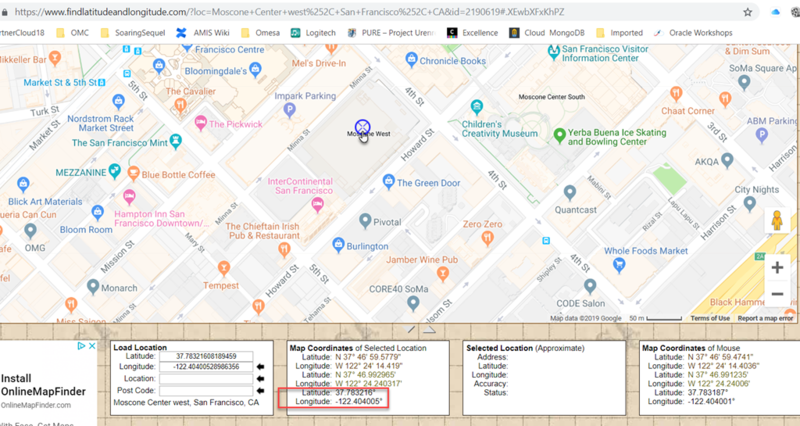 This makes the longitude and latitude of the venue location part of each session, and allows me to create a map visualization that indicates the locations of selected sessions. Starting from the data set prepared in the previous article – downloadable from https://github.com/lucasjellema/Oracle-OpenWorld-CodeOne-2018-SessionCatalog/blob/master/oow2018-sessions-clean.xlsx. I have opened the data set and explore the room column. The venue is included as first part of the string of the room column. And get a list of the unique venue values. 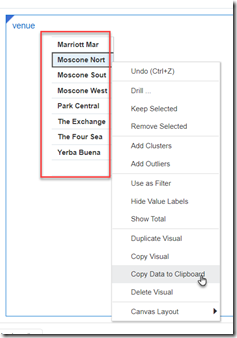 I can copy the values of the venues to the clipboard and from there to a text file or an Excel sheet. it also includes the names of the venues in full. Next I add this data set to my OAC instance. Data Flows are the data preparation pipelines in OAC that can take one or more data sets, perform one more operations on them – including adding and removing, merging and splitting columns, filtering rows, joining data sets, aggregating data sets, deriving values using machine learning models and more. 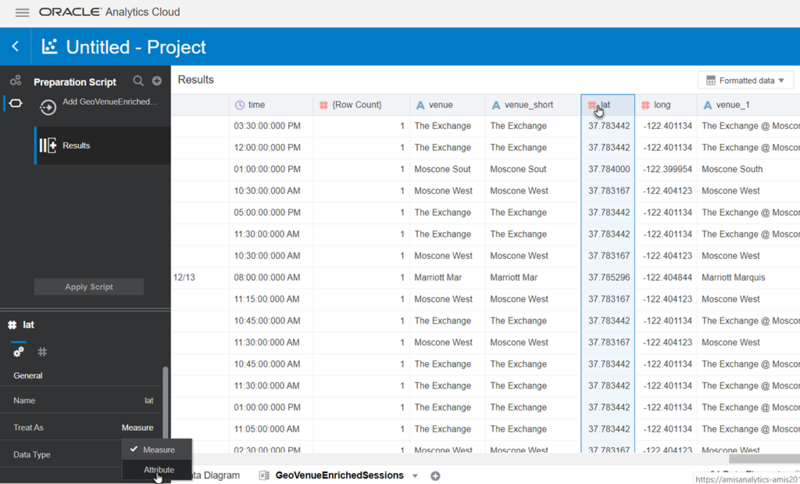 I now want a data flow to add the geo coordinates and the proper venue name to each session record. Add Save Data step – to record the output from the data flow as a (new) data set. 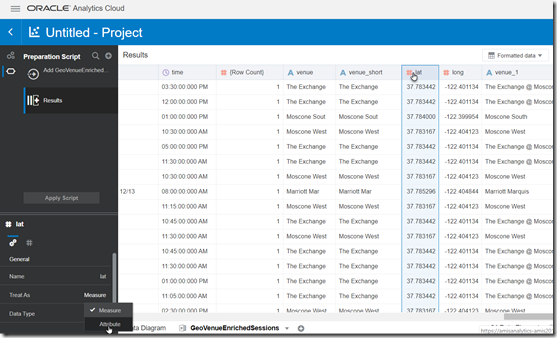 Configure the Save Data step. Then, press Save and Run Data Flow respectively. Unfortunately, we need to do one more thing: the columns lat and long in this data set should be treated as Attribute and not as Measure – otherwise we cannot use them in Map visualization. A Map is added to the canvas. 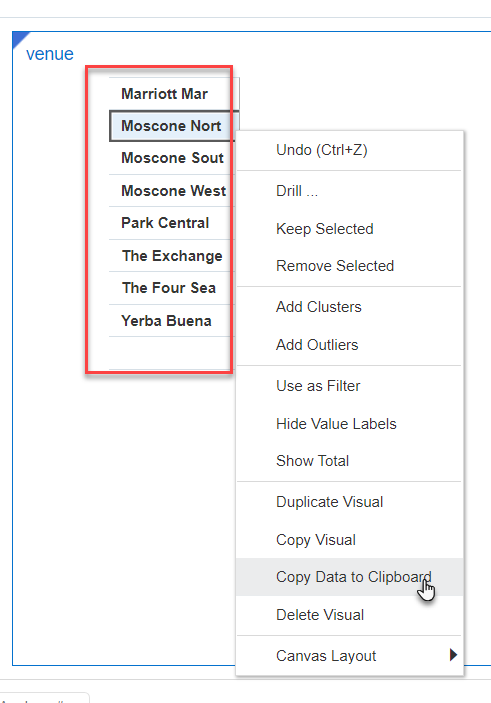 Select the lat and long data elements and drag them to the Category cell for Layer 1 for the Map. 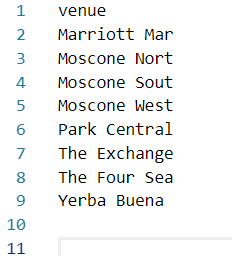 This should already make the outlines visible of downtown San Francisco, with blue points for each of the venues. When I click on the map, the property palette in the lower left hand corner changes into the map properties. I can now specify if the zoom controls should be shown, what the title is for the map, if the scale is in miles or km and more. 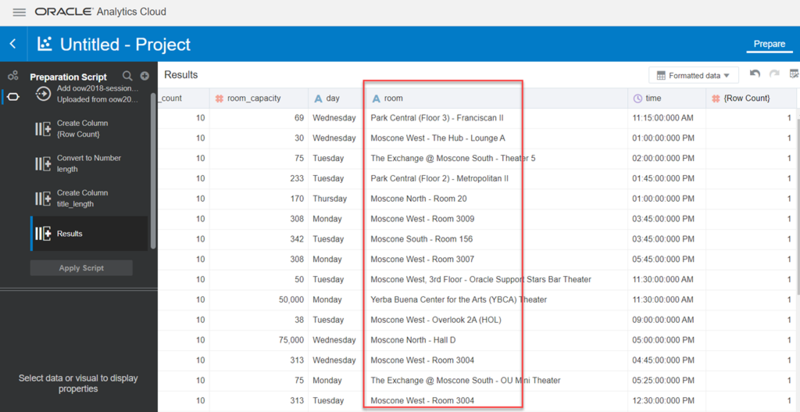 Clearly, CodeOne was far less spread out – using only Moscone West and North. Note: OAC does something undesirable: the color used for Moscone North is not the same in the two maps (green vs red). In the next example this happens again. In this final example, I have added a filter by day and am currently looking at only Sunday and Monday. The number of sessions in the Marriott hotel on these two days is 69. 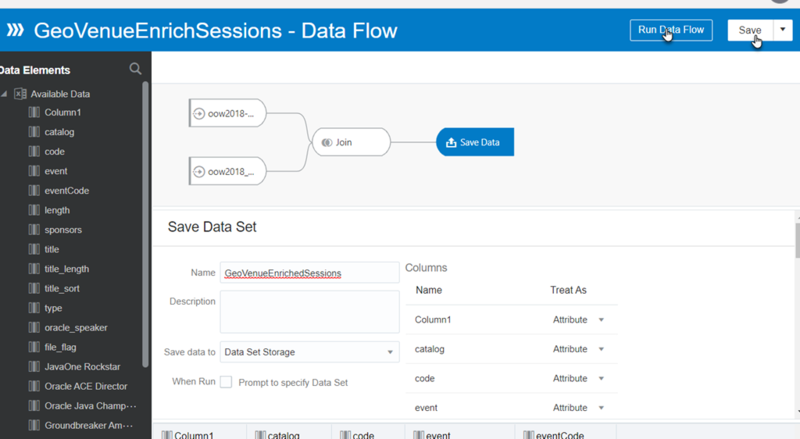 Data files are in GitHub repo: https://github.com/lucasjellema/Oracle-OpenWorld-CodeOne-2018-SessionCatalog (specifically https://github.com/lucasjellema/Oracle-OpenWorld-CodeOne-2018-SessionCatalog/blob/master/oow2018-sessions-clean.xlsx and https://github.com/lucasjellema/Oracle-OpenWorld-CodeOne-2018-SessionCatalog/blob/master/oow2018_geoenrichment.csv.